So, remember last week when I went to Target, but they were all out of the Real Riders and I asked the guy and he said they’d have more on Monday and all that? Well, he wasn’t kidding. They were fully restocked on Real Riders! I only grabbed the ones I wanted, the Silverado, Supervan, and 2002, and then grabbed a spare 2002 and Supervan. Sadly there was only the one Silverado so I couldn’t grab a spare of that. I looked through the mainlines and most of what had been put out had already been picked over. As I walking back down the aisle I glanced up at this sign and saw something hanging there. Yep, that’s the Team HW Corkscrew Buggy TH! So, some nice collector left this behind for someone to find. I’ve already got this one, but my daughter has really been getting into Hot Wheels lately. I went ahead and grabbed it and am gonna put it up until Christmas when I’ll put it in her stocking. 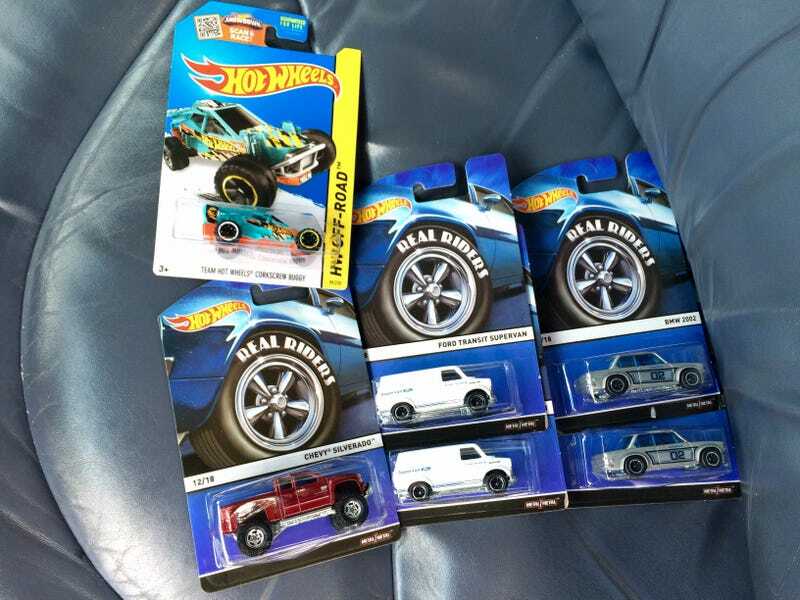 Oh, and as for the spare Real Riders, I am looking to trade for the Real Riders Bluebird 510 and Real Riders 240Z.